The social media age has been a boon for many advertisers, especially those that have invested in Facebook remarketing. On average, about 1.37 billion users actively check out Facebook on a daily basis. While it’s true that there are numerous competing platforms, none comes close to registering these numbers. In review, these numbers don’t paint the complete picture. The number of user visits does not necessarily translate to an impressive ad campaign. As an advertiser, you are probably more concerned about the clicks that you accrue over a given period. This is usually the yardstick that many marketers use to gauge just how effective their promotions went. A recent study revealed that on an annual basis, Facebook bags a whopping 22 billion ad clicks. Quite impressive. Especially when you consider that the population on the planet stands at about 7.7 billion people in 2018. From a marketing perspective, the question remains on how you can position your brand to receive a good chunk of the ad clicks numbers. Thankfully, we’re well-versed in Facebook remarketing strategies. So much so that today’s discussion is focused on how to tap into the aforementioned demographic. An efficient tracking system could make all the difference in the world. Good tracking systems will ensure that you’re able to cater to the needs of your custom audiences. To get started with the process, you first need to configure your Facebook Pixel. With the tracking system in place, you can kickstart your Facebook remarketing on a high. This is because you’ll start to build up a custom audience of those who have visited your website in the past 7, 30 or 90 days. 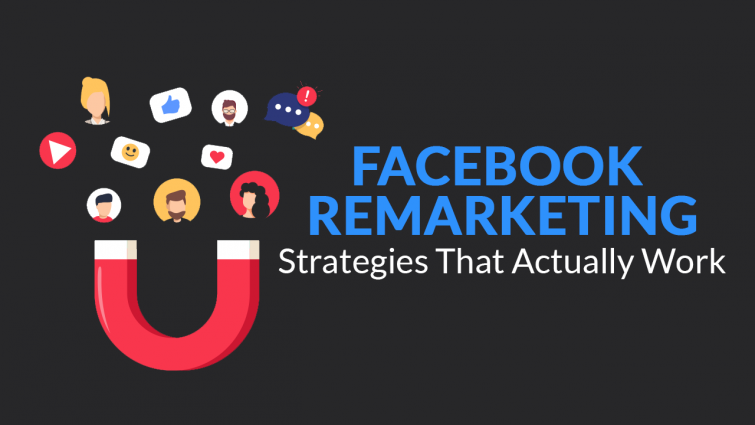 Facebook remarketing is fantastic because it’s much more effective than cold calling. All people you reach out to using Facebook remarketing have already expressed interest in your business. While this alone is sufficient grounds for anyone to go all out with their ad campaign, you need to do a little bit more. Depending on generic offers is not the best way to close a sale. A good way to run your campaign would be by tailoring your Facebook ads to resonate with particular audiences. Landing-page specific ads can give you more insights about your audience. You can use this information to meet your audience’s diverse expectations. You can segment your audience according to various tastes and persuasions. The higher the number of Facebook remarketing audience segments, the better the odds are to make a sale. Written word often has a powerful impact on many audiences. Your blog can be accessed by a myriad of people once you make use of email newsletters, paid ads and referrals. The keyword concentration on your blog can also attract people using search engines to check out what you have to say. The possibilities are simply endless. To ensure that you retain your reader-base, you need to aim for the tendons by sharing quality content. This approach ensures that your audience warms up to the idea of regularly reading new stuff that you post. You can also boost Facebook posts that have links to your blogs in order to gain more traction. Other incentives like eBook giveaways can also help endear people to your blog. You should always put yourself in the shoes of your target audience. Doing so allows you to have a feel of the experience you’re dispensing out. Your delivery needs to be imaginative enough to avoid lulling your audience to sleep after a while. Often times, people complain about repeatedly seeing the same ad. Ideally, ad campaigns are meant to appeal to an audience the first couple of times. Anything after that becomes overkill. To avoid such situations, you need to learn how to exclude converters from the current campaign. Those who have already clicked on an ad also need to progress to the next phase of your marketing funnel. This stage-based concept is one of the most effective Facebook remarketing strategies out there. This is because it continually tries to guide visitors to your website to become avid fans. Over time, the occasional blog-reader can be converted into a lead, before they complete the sale. To successfully do so, you need to come up with a system to offer the right offers at the best moments. A good remarketing funnel consists of about 5 key segments. The first is the awareness stage where you let your target audience gain appreciation of what you have on offer. The next stage involves spiking interest in the hearts of your audience. Curiosity is quintessential in business since it makes people become inquisitive about how to make utility of your product and/or service. The third stage is all about fanning the desires of people in a bid to compel them to push for the purchase. The last two stages involve eventual conversion and re-engagement for future purchases. Most importantly, you need to employ different tact all through the various stages in the manner you tailor your ads. The onus is thus on you to determine how far along the sales process a prospect is before you initiate the campaign. While it’s sometimes true that freemium users don’t bring in any revenue to you, they are still valuable. This is because they already know all about the business. Therefore, targeting them with ads is not a zero-game. They can cross-over and become paying customers. Free trials as a concept were conceived in order to assuage users fears about committing to a product. During the trial period, the objective should be to continually ensure maximum engagement with your product. Discounts are also great incentives to compel users to invest in what you have on offer. Your newsletter subscribers need to play a pivotal role in your Facebook remarketing efforts. This demographic consists of two major groupings. There are those who regularly read on what you share and those who never bother to open your emails. Given the distinction between the two, there’s great value in knowing where members of your audience lie. You can offer your active readers with Sign Up offers and an overview of how they can benefit from your product. In contrast, you should appeal to your inactive subscribers by launching a soft sell on the nature of your business. At the end of the day, your objective should always be to get as many people aboard the sales ship as possible.